Single cylinder and multi-cylinder cone crusher is mainly used in the secondary or tertiary crushing process for the medium and fine crushing. With coarse crushing equipment, it can meet the requirements of 1000t/h crushing of all kinds of ores. Is the working principle of these two crushers the same? Do they have any other differences? When the single-cylinder cone crusher works, the motor drives the drive shaft to rotate, and the drive shaft drives the eccentric sleeve to do the rotary motion. The spindle assembly can rotate with the center line of the spindle in the eccentric copper sleeve, so that the ore is constantly impacted and broken in the crushing chamber, and the crushed materials are discharged from the lower part. In addition, the single cylinder cone crusher also has the function of iron passing protection. When the metal block and other unbreakable objects falls into the crusher, the moving cone is lifted by the bottom hydraulic piston, moving cone rise, adjust the discharge port, the iron block and other unbreakable materials discharged from the discharge port. However, due to the limited lift stroke of the moving cone, the iron block cannot be too large. It is suggested to add iron remover before the single cylinder cone crusher. The working principle of multi-cylinder cone crusher is similar to that of single-cylinder cone crusher. 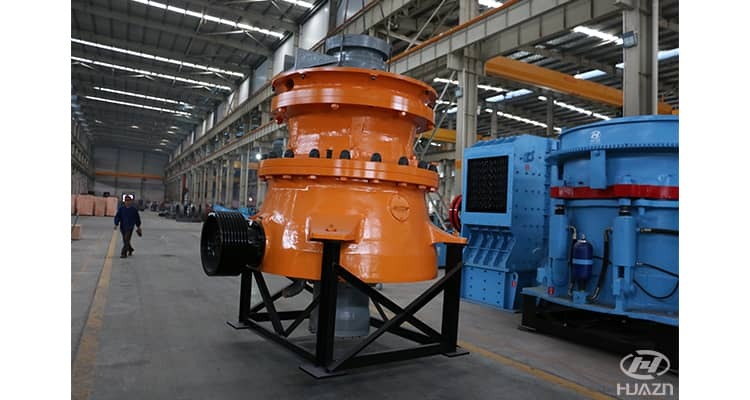 Motor drives drive shaft, and drive shaft drives eccentric sleeve rotation, but the shaft of multi-cylinder cone crusher is fixed, combined with the body frame, the eccentric sleeve and moving cone do periodic pendulum motion. When the materials fall into the crushing chamber, they are crushed through mutual extrusion, grinding and rubbing. Multi-cylinder cone crusher has hydraulic cavity cleaning function. When there are accumulated materials in the crushing chamber, the hydraulic cylinder works, pushes the fixed cone to lift, the discharging opening increases, and the materials fall down. Although these two crushers have some differences in working principle and other aspect, both of them are the main crushing equipment, taking the important share in the market and coexist in the long term.